Since the November presidential election, Democrats and the mainstream media have peddled a consistent message that Donald Trump is an illegitimate president. They provide a variety of reasons, but most have centered around Hillary Clinton’s victory in the popular vote, the perceived bias of the FBI, or the fact that Russian hackers aired Democratic dirty laundry which showed Clinton, her advisors, the DNC, and the mainstream media colluded against the Bernie Sanders campaign, believed that Clinton’s private server was in fact a problem, and intended to subvert the Catholic Church. The Common Room has already responded to Democratic distractions after the election, but the Democrats’ intention is clear–by attempting to label Trump as an illegitimate president, they are trying to deplete the political capital he needs to carry out his campaign promise to truly reform American politics, a reform that we have already seen will blur party lines. It’s not every day that unions are siding with a Republican president who is being attacked by Senator John McCain. Early returns indicate Democrats have been unsuccessful, as Trump’s approval rating has already risen 3 points to 59% since Inauguration Day, while the percentage of Americans who “strongly approve” of the job he is doing has risen 6 points over the same time period. Distractions aside, Trump is undoubtedly a legitimate president, one who won 30 states on his way to securing 306 Electoral College votes. Republicans also held the Senate and House of Representatives, despite many projections, and hold 33 governorships across the country. The most important question at this time does not center around Trump’s legitimacy–it’s whether Trump and the Republicans were given a mandate by the American people to drastically change the role of government in American society. A look at the principles the Framers of the Constitution used to form the foundation the American government, combined with a review of data, conclusively reveals a Republican mandate. In 2008, Democrats controlled 28 governor’s mansions. Today, the Republicans control 33. In 2008, Democrats controlled 25 state legislatures. Today, they control 12. In 2008, Democrats controlled 60 Senate seats, a supermajority which they held until Massachusetts voters elected Scott Brown, a Republican, in a special election to replace Ted Kennedy, the liberal icon. Today, they hold 48 (counting the independent Sanders), and failed to take back the majority despite projections, losing races they were once projected to win in Wisconsin, Pennsylvania, North Carolina, and Missouri. Furthermore, in 2018, Democrats are defending 10 seats in states Trump won, including seats in 5 states he won by more than 10 points. Republicans are defending one seat in a state won by Clinton (Nevada). In 2008, Democrats controlled 257 House seats. Today, they have 194. At the state level, Democrats have lost 935 legislative seats since 2008. With control of the presidency, Congress, and (soon-to-be) Supreme Court, Republicans will be able to set the legislative agenda, and they deserve to, since in contrast to the Democratic Party under Obama, the Republican Party built a national platform designed to appeal to voters across factions, just as the Framers intended. The pushback against claims that Republicans have a mandate stems from the fact that at a national level, election results have been very close in the number of votes that each party received. Looking at the national polling results for 2016 congressional elections, Republicans did hold a slight edge, with 48.7% of voters casting a ballot for a Republican congressional candidate, while 47.9% voted for a Democratic candidate. Despite the narrow margin, Republicans carried a 47 seat majority into the 115th Congress. Additionally, Hillary Clinton won the popular vote by around 2 percentage points, but Trump was elected president due to his victory in the Electoral College. However, as Sean Trende from Real Clear Politics points out in an article entitled “How Trump Won – Conclusions,” viewing voting numbers and even demographic changes without a geographic filter is meaningless, because United States politics is by its very nature based on geography. That was the intention of the Framers–a thorough read of “Federalist No.10” reveals a James Madison deeply fearful of the negative effects that a majority can have on the rights of a minority in a pure democracy. The Framers designed the system of American government as a republic so that in order to build and maintain power, factions (our modern day political parties), would have to build a national coalition with cross-regional appeal. They believed that for a faction to build national appeal, it would need to moderate its desires to attract and appease regional factions, and in that moderation, would not present as acute a threat to the rights of the minority. In addition, a republican system called for the election of representatives who could (ideally) place themselves above public squabbles due to patriotic motivations and a sense of serving the greater good (though whether the modern primary system instituted in 1972 truly reflects the wishes of the Framers is up for debate). Madison explains that even though the Framers feared factions, they understood that it is human nature to form opinions, and those opinions would drive the formation of factions. To control faction while preserving liberty, the Framers designed a system where factions would be limited by a republican form of government–even factions that may control a pure majority. Just as they feared faction, they also feared that the tyranny of the majority which in a pure democracy would lead to turbulence and dramatic swings from one faction to the other, with each faction using its total hold on power to attempt to stamp out the minority. Madison argues that the reason the Framers decided to create a republic, is because a republic offers a “greater number of citizens, and greater sphere of country, over which [a republic] may be extended.” Madison goes on to write that “extend the sphere [of a republic], and you take in a greater variety of parties and interests; you make it less probable that a majority of the whole will have a common motive to invade the rights of other citizens; or if such a common motive exists, it will be more difficult for all who feel it to discover their own strength, and to act in unison with each other.” In practical terms, the Framers said that for a party to control the government, it must be a national party–one which has a majority not just in a single region or city, but one that has built a truly national platform to attract cross-regional support. Only a party with a platform designed to appeal to citizens across regions would be able to rise to power. The Framers wanted to create a system where even though Virginia was the largest, wealthiest, and most populous of the thirteen states, for Virginia representatives to drive legislation that benefited their home state, they needed to find a way to align their goals and interests with representatives of other states whose interests may have varied greatly from those of Virginia. In local, state, and congressional elections under Obama, and then in the 2016 presidential election, the Democrats did not successfully put together a party platform that appealed to a national base. Rather, their platform, built largely on identity politics, was designed to appeal to urban areas. In that respect, their strategy was successful, as Democrats expanded their power in urban areas more than ever before, which led to them racking up sizeable vote totals and large margins of victory. However, the reason for their rapid loss of power is that the price of building a platform designed to appeal to urban Americans, a platform with a heavy focus on race, climate change, regulation of speech, and gun control, is that they ceded power in all other areas of the country. The more votes Democrats have received in cities, the fewer votes they have received in suburbs, towns, and rural areas. The Framers understood the dangers of a faction designed only to appeal to one region or area, regardless of that region’s population. They knew that policies which get 75-95% of the vote in Washington, D.C., New York, and Los Angeles should not be forced on the rest of the country, unless the rest of the country also supported those policies. They structured the American political system to reward a faction seeking to rise above region and appeal to a national base, and that why they instituted a political system that can lead to a disparity between national voting numbers and the number of seats won by a party. Expecting the national voting numbers to determine the proportion of representatives in Congress is similar to expecting the yardage in a football game to determine the margin of victory. Neither are indicative of the outcome. Trende’s research after the 2016 election that backs up Madison’s view. Though he focuses purely on the presidential election, it’s logical to infer his research also applies to congressional and state elections, considering the vast majority of Americans vote for candidates from the same party in both presidential and congressional elections. Trende breaks the US population into six groups – mega cities, large cities, small cities, large towns, small towns, and rural. 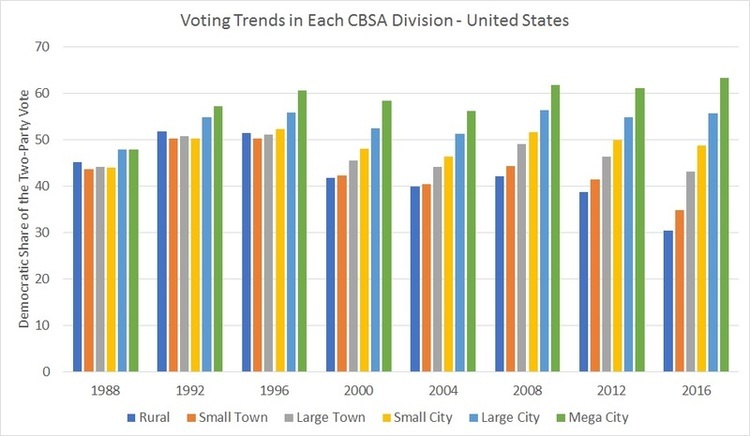 Hillary Clinton fared better than any Democrat in history in “mega cities,” which Trende defines as cities with populations over 5 million, where she won around 65% of the vote. However, as the below graph shows, she performed worse than Obama and Bill Clinton in large cities (cities with populations between 1 and 5 million), performed about equal to Al Gore in small cities, and performed worse than Michael Dukkakis (who lost 40 states) in large towns, small towns, and rural areas. Though the Republican Party has dominated rural areas in recent elections, Trende points out that rural areas actually make up the smallest portion of the US population. Therfore, in addition to rural areas, the GOP draws its strength from small cities, large towns, and small towns, all areas where Trump won over 50% of the vote. Given the small population of rural areas, it is really the suburbs of large cities (the large and small towns) where the Republican base is located, like Waukesha County outside of Milwaukee, Wisconsin. While the GOP has controlled much of the Great Plains, South, and Mountain West for decades, the key to its increased power in recent elections has been its growing strength in the Midwest, and continued hold on power in populous, growing states like Texas, Florida, and (to an extent) North Carolina. Trende points out, “the slide from Bill Clinton ’92 (the populist; Paul Tsongas was the “emerging majority” candidate that year) to Bill Clinton ’96 (the progressive centrist) to Al Gore to John Kerry to Barack Obama to Hillary Clinton ’16 is a progression of candidates that are increasingly urban and urbane. This played well in the mega-cities and enabled Democrats to win large cities. But it probably hurt them everywhere else.” In past elections, the Democrats were so focused on identity politics to grow their urban base (“the ascendant coaltion”) that they no longer offered a platform designed to appeal to the nation. Whereas the Democratic Party debates removing references to God from its official party platform in a country where Gallup reports that 77% of the population identifies as Christian, the Tea Party movement and rise of Trump have refocused the Republican Party on offering solutions to issues that a broad, bipartisan segment of the American public agrees are in need of reform. For example, in June 2016, Gallup reported that the four most important issues to Americans were the economy, dissatisfaction with government/poor leadership, unemployment/jobs, and immigration/illegal aliens. Trump (and the Republican Party) ran on a promise to change the status quo on all of those issues. Both Rasmussen (2014) and Gallup (2015) polling showed that on these major issues, voters trusted the Republican Party more than the Democratic Party. Focus on issues viewed as important by the American people, coupled with trust in the party to find solutions to those issues, allowed the Republican Party to build the cross-national coalition that swept them into power in the House of Representatives in 2010, the Senate in 2014, and the Presidency in 2016. Ohio is always considered the bellweather state, and no Republican candidate has ever been elected president without winning Ohio. It is the 7th most populous state, has three large cities with metro areas over 1 million people, and contains both a strong industrial base in the East and strong farming community in the West. Though Barack Obama won Ohio twice, Trump won by 8.5%, and during the Obama presidency, Ohio also elected a Republican governor, Republican senator, and gave the Republican Party majorities in both houses of its state legislature. Trende provides the below map which illustrates the increase in Republican strength over the past decade, with once blue counties flipping to red, especially in industrial Eastern Ohio. In Ohio, like in the entire country, the Republican Party built a platform flexible enough for them to win in the suburbs, small towns, and rural areas, while getting enough votes in the state’s large cities to win statewide elections for governor in 2010 and 2014 and senator in 2010 and 2016. The Framers designed the American political system to reward the party who could build the coalition that crossed traditional regional and urban/rural boundaries. From the New Deal through the mid-1990s, the Democrats controlled the House of Representatives for 58 of 62 years, and the Senate for 52 of 62 years. The Democrats built a coalition of workers in the Northeast and Midwest and evangelicals in the South–groups with very different interests and goals. However, the progressive shift in the Democratic Party which has culminated in a party with a platform singularly focused on cities, has reversed its fortunes, made the conservative Blue Dog and pro-life Democrat a thing of the past, and allowed the Republican Party to build a coalition that crosses regions and includes factions with varied interests. Given the way the Framers structured the American political system to reward the party who could build that type of coalition, if the Trump administration is free from scandal and can deliver on its promises, there is no reason to think that Republican strength will cease to carry into the near future. The biggest fear of the Republican Party is a disastrous Trump administration, because that would reverse the gains Republicans made in previously Democratic areas. Americans would again favor Democratic solutions to what they identified as their most pressing problems, allowing the Democrats to once again build a large, cross-regional coalition. However, given Trump’s campaign promise to reform inner cities, the worst case scenario for Democrats is that support for his policies among minority inner city populations starts to cut into their margins in cities. Should Trump win just 20% of the African-American vote, Virginia at the very least would project to flip to the Republican Party in a presidential election. In the end, though the national polling numbers are close, research shows those numbers are disproportionately driven by Democratic margins in large cities, and more than ever in 2016. When the Democratic Party stopped appealing to working class Americans and social conservatives in the South and Midwest by turning its focus to the large cities and their liberal constituencies, it ceased to offer a platform that was appealed to the entire nation or was trusted by Americans to solve the problems they felt were most important to them. The Tea Party wave, which brought Republicans back to power in Congress, coupled with the election of Trump, refocused the Republican Party on offering solutions to pressing issues felt by the American people. The Republican Party successfully built a platform that in congressional elections in 2010, 2012, 2014, and 2016, not to mention the 2016 presidential election, appealed to farmers in Wisconsin, coal miners in West Virginia, suburbanites in Florida, steelworkers in Ohio, and evangelicals in Texas–all groups with different interests and backgrounds. In doing so, they fulfilled the vision the Framers had of a faction that could rise to power, because like the Democrats from the 1930s-1990s, the Republican Party united various factions across the entire nation, which in the eyes of the Framers, gives them a mandate to reform the American political system. Previous Post Beer of the Week: Penguin Pale Ale, One Barrel Brewing Co.